Yesterday our friends Jeremy and Becky picked us up at the trailer and took us on a tour of Moody AFB. Jeremy is a search and rescue pilot on the C-130 aircraft. He showed us the airstrip and we saw a plane taking off. Later, we hear the plane firing at the practice range. It was a fun and informative tour. After the tour, we stopped by the Base Exchange and Malcolm got a haircut, as did Jeremy and Becky’s son. We headed from there over to Family Pizza, a nice little mom and pop pizza place just outside the base. We dropped Jeremy back off on the base and headed to their daughter’s school to pick up Arco, their adopted bomb sniffing dog. 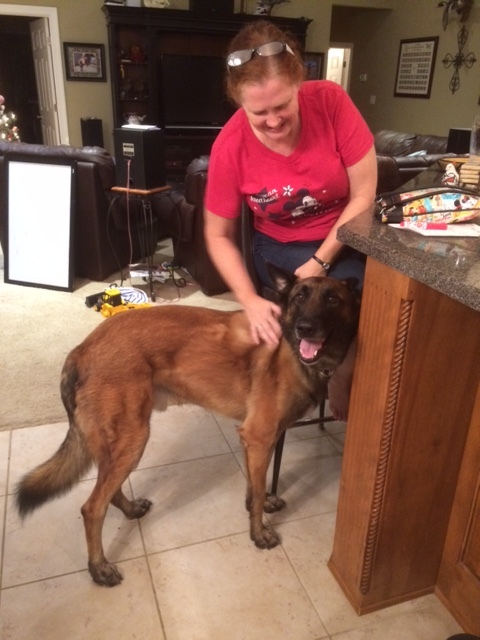 He gets to “sniff for bombs” at the elementary school a couple mornings a week along with a local Sheriff’s deputy. After picking up Arco, Becky dropped us off at the trailer for a couple hours while she ran some errands. We did the same, dropping by the post office, the grocery store and the gas station to fill up the truck. We headed back to the trailer and waited until someone came to pick us up. Becky stopped by with both the children as their daughter, Morgan, wanted to see the kitty cat. After a short visit, we headed over to their house for the evening. Malcolm and Jeremy grilled steaks and chicken and we had a great dinner. We visited until fairly late in the evening then said our goodbyes and Jeremy dropped us off at the trailer. This morning we hooked up and headed out a little after 8AM. The goal was to drive as far as Florence, South Carolina on I-95. 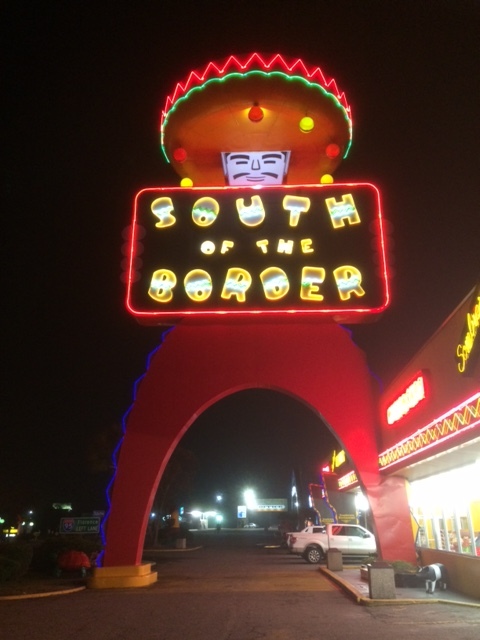 We had picked out a campground in the area, but kept seeing billboards for a place called “South of the Border“. Val looked them up on her iPad and found they had a campground along with several restaurants and other attractions. It is a very touristy spot, indeed. We decided to push on another 30 minutes and stay there. We arrived just as the sun was setting and ended up setting up the trailer in the dark, though it wasn’t too bad. 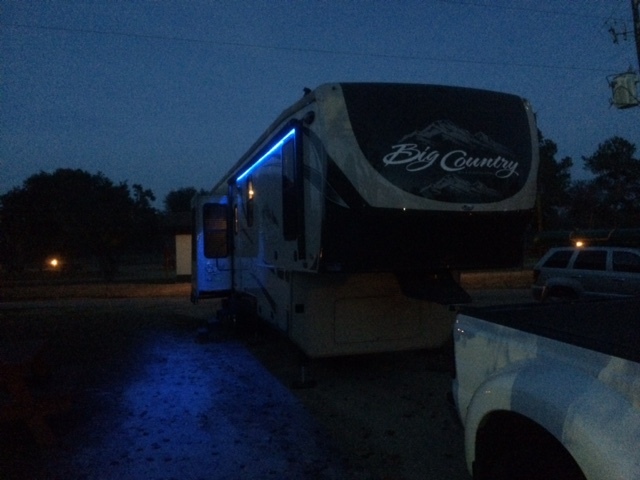 We unhitched, leveled, hooked up the power cord, ran the slides out and dumped the cat inside then headed to dinner at one of the local restaurants. We had pretty good Mexican food, walked around three of their shops and picked up a couple items then headed to fill up the truck with fuel. After that, it was back to the trailer to relax and unwind. License plates today reflected the fact that we were traveling on I-95. 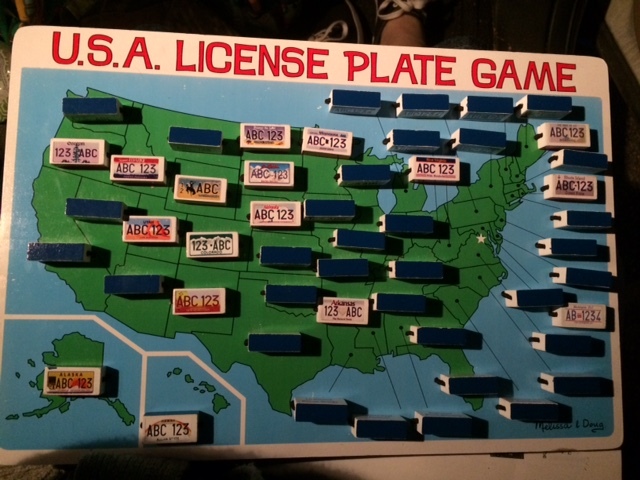 We got 34 of 51 plates, mostly from the eastern seaboard and midwest. This entry was posted in South Carolina, traveling. Bookmark the permalink.